On March 28, 1798, General of Brigade Louis Nicolas Davout accompanied his good friend General Louis Desaix de Veygoux to the rue de la Victoire where, for the first time, he met General Napoleon Bonaparte. The Conqueror of Italy was preparing for the Egyptian Campaign and was in need of good officers. However, the twenty-eight year old Burundian did not make a very good first impression. But being assured by Desaix, for whom Bonaparte had recently acquired a high regard, that Davout was a reliable and capable officer, his name was added to the list of those to take part in the expedition. Davout was the descendant of a noble family which could trace its origins back into the 13th century. So strong was the military tradition of the family that all of Burgundy was familiar with the expression: "When a d'Avout is born, a sword leaves its scabbard." Young Louis was educated first at the military school at Auxerre, and then at the Ecole Militaire in Paris. In 1788 he entered the king's service as a second lieutenant and the following year embraced many of the ideas of the Revolution. In 1790 Davout spent six weeks in prison for his political activities and was then dismissed from the army. The following year he enlisted in a volunteer battalion of the department of Yonne and, because of his previous military training, was elected lieutenant colonel (second in command). He was only twenty-two years of age. Serving with the French armies in Belgium and Germany during the early years of the revolutionary wars, he rose to the rank of general of brigade. His military record was commendable for so young an officer, but not necessarily outstanding. The Egyptian Campaign provided the first opportunity for Bonaparte to observe Davout, who initially was under the direct command of General Alexandre Dumas, commander of the cavalry of the expedition. In the fall of 1798, he was sent up the Nile with a cavalry detachment to join Desaix's division in upper Egypt. Later he commanded a military district just south of Cairo. On October 10, 1798, Bonaparte first gave evidence of satisfaction with Davout: "The commanding general," he wrote, "wishes to give General of Brigade Davout a testimony of the satisfaction of the government for the service which he has rendered to the armies of the Republic." Despite this faint praise, when Bonaparte returned to France late in the summer of 1799, Davout was not among the chosen officers who accompanied him. Furthermore, when Davout and Desaix did return from Egypt the following year, Davout was ordered to Paris to await assignment, while Desaix was called to join the Army in Italy, where he met his death on the battlefield of Marengo. Davout was uncertain of the reception he would receive from the First Consul, as he had not become a favorite during the Egyptian Campaign. General Andoche Junot, a close friend of Davout's at that time, told his wife that "the First Consul does not like Davoust [sic], because when in Egypt he associated with all of those who made a point of being hostile to Bonaparte. I do not know that Davoust [sic] can be justly ranked among the First Consul's enemies; but it is certain that he has inspired him with an antipathy as complete as one man can entertain for another. I am the more sorry for this, inasmuch as Davoust [sic] is my comrade and a clever man." To this Madame Junot, who openly admitted her dislike for Davout, added her own opinion: "This dislike," she wrote in her Memoirs, "of which all who were with Bonaparte in Egypt might have seen proofs, had a singular source. It originated in the personal slovenliness of Davoust [sic], who, by the way, was at that time the most dirty and ill-dressed man imaginable--a fault Napoleon held in aversion, being himself always particularly neat and clean." Another of Davout's detractors, General Louis-Antoine Bourrienne, who is somewhat more reliable than Madame Junot, also gives testimony of Bonaparte's dislike for Davout while they were in Egypt. "How were you able to keep company for such a long time with a man [Davout] whom you have always called a f--- Bête"? Bourrienne asked the First Consul. "But I had not known him well [replied Bonaparte.] He is worthy of more than his reputation, you will also get over it." It was indeed only after the Egyptian Campaign, that is during the Consulate, that Bonaparte learned to like Davout. Gradually he came to recognize in him military and administrative talents, and to realize that he was personally attached to him. Ability and loyalty were not always to be found in the same individual, and the First Consul made full use of that combination which he found in Davout. In July 1800 Bonaparte promoted him to general of division and sent him to Italy to command the cavalry during the last phase of the war with Austria (1800-01). Davout was then given a command in the "Consular Guard". In 1803 he assumed command of the camp at Bruges and commanded the III Corps of the Grand Army during the Ulm/Austerlitz Campaign of 1805. But the clearest indication of favor came on May 19, 1804 when Davout was named among the original marshals of the newly created Empire. Davout's elevation to the dignity of Marshal of the Empire, which is still the subject of speculation and debate, was based on many factors. His personal attachment to Napoleon was certainly a major asset. His military and administrative abilities were also undoubtedly serious considerations. But alone these may not have been sufficient. He had been, after all, an unknown general of brigade at the time of his return from Egypt in 1800; and even in 1804 Davout had never commanded a division in combat. But in 1801 he had married Aimée Leclerc, the sister of Charles Leclerc who was married to Napoleon's sister Pauline. In this manner, he had become a member of the Bonaparte "family," to use the term in its broadest sense. Had Charles Leclerc not died of yellow fever on the island of St. Domingue in 1802, while leading an expedition against rebellious forces, he surely would have been named to the dignity of marshal. It is possible that Davout received the marshal's baton which would have gone to his brother-in-law. While that may be simple speculation, that which is certain is that Madame Davout never forgave Napoleon for the death of her brother, which she clearly placed at his door-step. There is also the possibility, once again only speculation, that Davout received the marshal's baton that would have gone to General Desaix had he not died of wounds received at the battle of Marengo. Davout was, after all, Desaix's closest friend and the man who had introduced Davout to Bonaparte and then supported him during the Egyptian Campaign. When one puts aside all of the guessing and speculating, that which remains is that Davout had become firmly attached to Bonaparte during the years of the Consulate. He came to equate the First Consul with the destiny of France, and through the Empire he was one of his staunchest supporters. In Davout's eyes, Napoleon was the man who had saved both the Revolution and France. Finally, it should be noted that Napoleon's supporters have viewed his selection of Davout to be a marshal--and his giving him command of the III Corps of the Grand Army before Davout had proven himself at Austerlitz and Auerstädt--to show that the Emperor was an excellent judge of character and ability, and of men in general. Davout strove diligently to justify the trust Napoleon placed in him, and the honors and wealth he bestowed upon him. In the principal campaigns of the Empire he proved himself one of the most capable generals in the army. At Austerlitz he withstood the main Russian attack on the right flank, thus playing a critical role in the Emperor's victory; at Auerstädt he defeated the main Prussian army which was twice the strength of his own III Corps; at Eylau he arrived on the battlefield in time to prevent a French disaster; at Eckmühl he held the Austrian army of Prince Charles at bay until Napoleon could bring up assistance, and then took part in the defeat of the enemy; and at Wagram he turned the Austrian left and drove it from the field. As an administrator he performed equally well in the Duchy of Warsaw (1807-09), Germany (1810-12), at Hamburg (1813-14), and as Minister of War during the Hundred Days. He was also one of the principal organizers of the army that invaded Russia in 1812 and of the army that Napoleon led into Belgium in 1815. His own corps was always one of the best trained, best disciplined, and best supplied in the field. General Armand-Augustin Caulaincourt, after passing Davout's men on their way to the Niemen in 1812, wrote of them: "The men of the First Corps (Davout's) were noticeable for their fine bearing and general smartness. Coming from excellent quarters, fresh from the hands of a commander who had drilled them long and well, they could rival the Guard." Service such as rendered by Davout did not go unnoticed or unrewarded during the Empire. Napoleon bestowed upon him titles, honors, and wealth. In 1807 Davout was made the Duc d' Auerstädt in recognition of his defeat of 66,000 Prussians with his single corps of 26,000 men. Two years later he was made Prince d'Eckmühl for his key role in the defeat of the Austrian army in April 1809. He received more than 900,000 francs, in addition to his regular pay, from the hands of the Emperor--an amount second only to that given to Marshal Alexandre Berthier. Napoleon is reported to have once said that "It is necessary that I give to Davout, for he does not take for himself." The Emperor also gave him extensive lands in Poland from which he derived a substantial annual income until 1813. These and other honors, such as the Grand Eagle of the Legion of Honor, clearly show that the amicable relationship between Napoleon and Davout was not one-sided and worked to the benefit of both men. However, there was competition for the throne which never materialized. Jérôme Bonaparte, although he was already King of Westphalia, considered himself to be the imperial candidate; while Joachim Murat, King of Naples--and the Emperor's brother-in-law--would have liked to have been promoted to the throne of Poland, much as Joseph Bonaparte had moved from the kingship of Naples to become King of Spain in 1808. Finally, there was Prince Joseph Poniatowski, who stood in the wing as the "legitimate" heir to the throne. Nevertheless, Bourrienne records in his Memoirs that Davout actually told him in 1811 that Napoleon had already promised him the kingdom of Poland. Although every effort has been made by the Marquise de Blocqueville to disclaim her father's desire for the throne of Poland, there can be little doubt but that Davout aspired to kingship. After all, did he not have before him the example of men less capable than himself: Napoleon's three brothers, Joseph, Louis and Jérôme, as well as Murat and Jean Baptiste Bernadotte--the latter having become the heir apparent to the throne of Sweden. Napoleon, if he did not actually encourage Davout in this aspiration, certainly did nothing to discourage him. The Emperor seemed to approve of, if not actually like, for his subordinates to chase after thrones as well as marshal's batons. Davout, who was perhaps one of the most unpopular of the marshals amongst his peers, seemed to have a special talent of making enemies in high places. In 1809 he made a lasting foe of Marshal Berthier, Napoleon's most capable chief of staff, and a man who always had the ear of the Emperor. The campaign of that year opened with a near disaster for Davout and his III Corps as a result of Berthier's misinterpretation of Napoleon's orders. Although Davout saved the day, he was critical of Berthier, and the Chief of Staff never forgot or forgave him. During the first months of the Russian Campaign Davout made enemies of two kings; Napoleon's brother Jérôme and his brother-in-law Murat. His enemies, who had easy access to the Emperor, undermined the Napoleon's faith in the Marshal. Davout's enthusiasm for the 1812 campaign was interpreted for the Emperor in terms of his passion to mount the throne of Poland at its successful conclusion. His energetic actions were represented as his desire for self-glory. Louis-Philippe de Ségur, who was present at Imperial headquarters in the days preceding the opening of the campaign, reported the following attack upon Davout: "The marshal, they said, wishes to have it thought that he has foreseen, arranged, and executed everything. Is the emperor then to be no more than a spectator to this expedition? Must the glory of it devolve on Davoust [sic]? To which Napoleon exclaimed: 'One would think it was he who commanded the army.'" Nor did his enemies stop short at this point continued Ségur. Once they realized they had the emperor's attention, they launched a full scale attack on the absent Marshal. "Was it not Davoust [sic]," they continued, "who, after the victory of Jena, drew the Emperor into Poland? He who already possesses such large properties in that country, whose accurate and severe probity has won over the Poles, and who is suspected of aspiring to its throne?" There was just enough truth in these words, despite their exaggerations, inaccuracies, and over-simplification, to sow the seeds of doubt in the mind of the emperor. One cannot be sure, as is implied by Davout's apologists [Blocqueville, Vigier, Joly, and Chenier ], that it was Napoleon's pride and selfishness that drove the wedge between the Marshal and himself. But there is no question of Napoleon's jealousy of his military reputation and glory upon which his supremacy in France and Europe depended. His reluctance to share with Davout the conquest of the Prussian army in the autumn of 1806, although he did eventually give him the title of Duc d'Auerstädt, his refusal to grant Marshal Nicolas-Jean de Dieu Soult the title of Duc d'Austerlitz, although he did give him the title of Duc de Dalmatia, and the manner in which he kept to himself the Battle of Marengo, are but a few examples. The conquest of Russia was to be his greatest military triumph. Davout was but one corps commander, one of his best to be sure, but, nevertheless, merely one of the many clogs in HIS war machine. The Emperor was in need of good generals, but he would not tolerate a rival within his own camp. Thus by the opening of the Russian Campaign the relationship between Napoleon and Davout had already begun to deteriorate. Then the combination of the quarrels between Davout and Jérôme and Murat on the one hand, and the disastrous failure of the campaign on the other, led to a further breakdown in this once good relationship. In the opening phase of the campaign, in the summer of 1812, Jérôme's incompetence as commander of the several corps on the army's right flank led to the escape of the Russian army commanded by General Peter Bagration. In a last desperate attempt to prevent Bagration from joining forces with the main Russian army at Smolenks, Davout assumed command of Jérôme's corps--in accordance with secret orders from Napoleon, of which Jérôme had no knowledge. Davout's orders were to assume command of the joint forces of Jérôme and his own once the two parts of the army had linked up. But, as Bagration was escaping the trap set for him as a result of the slowness of Jérôme's advance, Davout took command of Jérôme's corps prematurely. When the King of Westphalia learned that he was to serve under Davout, a mere prince with whom he had quarreled while in Germany in 1810-1811, he quit the army and returned to his kingdom. Napoleon was furious that the Russians had escaped and with the actions--or perhaps better, the lack of action--of his younger brother. Nor did he believe that Davout was completely justified in taking command of Jérôme's corps before the two forces were actually united. "Write to the Prince d'Eckmühl," he instructed Marshal Berthier, "that I am not satisfied with his conduct towards the King of Westphalia; . . . [However, that since he has taken command, he should keep it, but that he would have done better not to have taken it, because he had not united with the King.]" The conflict between Davout and Murat arose from the reckless manner in which the King of Naples conducted the advance guard with Davout in direct support. Murat complained bitterly to his brother-in-law, the Emperor, of Davout's lack of support; to which Davout replied that the King may destroy his own corps before the enemy was engaged in battle, but not the I Corps (Davout's). Napoleon sided with Murat and detached units from Davout's corps and placed them directly under the king. The two men again quarreled after the army's departure from Moscow. This time it was in the presence of the emperor, over the best road to take back to Smolenks. Again Napoleon sided with Murat. But it was the Ney affair that provided the clearest indication of Napoleon's changing attitude towards Davout. When Marshal Michel Ney's III Corps, which formed the rear guard of the army as it retreated west from Smolenks, was cutoff and destroyed, Davout was made the scapegoat. His I Corps, which was marching one day in front of Ney in accordance with the emperor's orders, had been forced to fight its way through a strong Russian position that blocked the road from Smolenks to Krasny. After Davout, who had been supported by the remnants of the Corps of Eugene de Beauharnais in his escape, had passed, the enemy strengthened its position and waited for Ney. There was no hope of saving Ney's diminished III Corps. Napoleon had over-extended his marching column, so that there was at least three days march between the advance guard and the rear guard. Thus there was not the possibility of concentrating the French army in order to force open the road for Ney. Davout, with but a fraction of his original strength, could have done no more than made a gesture, since virtually the entire Russian army was between himself and Ney. When it was believed that Marshal Ney had been lost with his entire army corps of 6,000 men, Napoleon and Berthier blamed Davout for not having retraced his steps in order to have saved them. With the emperor setting the tone, writes Caulaincourt, "It is impossible to describe the unbridled rage and fury that everyone showed towards Marshal Eckmühl, and scarcely any even when he came into the presence of the emperor, or when anyone met him face to face." Not until after it was known that Ney had escaped capture with a small part of his Corps, did criticism of Davout diminish. Nevertheless, with the help of his enemies, particularly Berthier, he remained in a state of semi-disgrace at imperial headquarters. It was of course to the benefit of both Napoleon and Berthier to make Davout responsible for the loss of the III Corps. The emperor was becoming skilled at the art of blaming others, and is some cases with justification, for the failures and misfortunes which were overtaking the empire. Then, on the eve of his departure from the doomed army early in December 1812, Napoleon received Davout, along with the other marshals, in a friendly and amicable manner. Indeed, he wished to leave behind him as loyal a group of generals as possible. However, there is no question but that Davout had fallen from favor. He was, for example, the only marshal who had taken part in the entire Russian Campaign who was not allowed to return to France on leave during 1813. When the army was reorganized for the spring campaign of that year, Davout was sent to Hamburg to punish German civilians for not being good Frenchmen. After the battle of Leipzig, he was left without orders while the bulk of the army retreated behind the Rhine. Encircled and besieged by an allied army, he held Hamburg until after Napoleon had abdicated, and only then did he turn over his command to a general appointed by the new Bourbon government. Upon his return to France in the early summer of 1814, Davout was not welcomed by Louis XVIII and his royalist regime. He retired to his estate south of Paris and was forbidden to come to the capital. When Napoleon returned from Elba in March of 1815, Davout, who had never sworn allegiance to Louis XVIII--as had most of his fellow marshals--, once again offered his services. It was the first time that he had seen the emperor since the latter's departure from Russia in 1812. Although he asked for a field command, Napoleon insisted that he accept a desk job, that of minister of war. The emperor had need of an organizer and a disciplinarian who by virtue of his military experience and reputation would command the respect and loyalty of the army and would not be dominated or controlled by the civilians. Despite their differences in the past, Napoleon believed that if there was one man in all of France in whose hands Paris and his government could be entrusted while he was on campaign, it was Louis Nicholas Davout. The relationship between the emperor and his minister of war was one of need and duty. Many of Napoleon's former supporters--Marshals Berthier, Ney, Murat, Nicholas Oudinot, to mention but a few--either did not offer their services or were refused service because of previous conduct. The emperor was in desperate need of loyal and capable men, and Davout was a welcome addition to the restored imperial regime. However, there was not the affection which had marked the early years of the empire. Davout still saw in Napoleon the savior of the revolution and the best government for France. But the personal attachment, which Davout had felt in the years prior to 1812. had diminished. He continued to equate Napoleon with France; and, therefore, he believed it to be his duty to serve, but his principal consideration in serving was now the good of France. When Napoleon returned from Waterloo, Davout was one of the few who counseled the continuation of the struggle. But when the emperor first hesitated and then refused to dissolve the assemblies, Davout supported abdication. As military commander of Paris and of the army, he arranged the removal of Napoleon to Malmaison and finally saw to his safe conduct to Rochefort. Davout had remained loyal to Napoleon until after the second abdication. Furthermore, he prevented Joseph Fouché and the anti-Bonapartists from using the ex-emperor as a bargaining tool in their negotiations with the Allies. The second abdication severed the bond of union between Napoleon and Davout. Their relationship ended on almost neutral terms, much as it had begun. Napoleon had needed and used Davout, without the latter being a close friend or confidant. The marshal was grateful for all that Napoleon had done for him and for France. Vicomte d'Avout, Les d'Avouts: étude généalogique d'une famille d'ancienne chevalerie du duché Bourgogne. (n.p., 1952), p. 10. Davout was not a classmate of young Napoleon Bonaparte. Napoleon left the Ecole Militaire just before Davout arrived. One of the most out-spoken critics of General Bonaparte was General Alexandre Dumas, Davout's immediate superior in the summer and fall of 1798. The Duchess d'Abrantes, Madame Junot, Memoirs of Napoleon, His Court and Family. (London: 1836), vol. 2, pp. 38-39. Ibid., vol. 2, p. 39. Louis-Antoine Fauvelet de Bourrienne, Memoirs of Napoleon Bonaparte. vol. 4, p. 292. Armand-Augustin Marquis de Caulaincourt, Duc de Vicence, Mémoires du général de Caulaincourt, duc de Vicence, grand écuyer de l'empereur. (Paris: Plon, 1933), vol. 1, p. 342. Adélaïde-Louise de Blocqueville, Le Maréchal Davout prince d'Eckmühl: correspondance inédite 1790-1815: Pologne, Russie, Hambourg. 4 vols. (Paris: Perrin, 1887). vol. 2, p. 160. Adélaïde-Louise was Davout's daughter. Ibid., vol. 2, p. 261. Ibid., vol. 2, p. 262. Bourrienne, Memoirs of Napoleon Bonaparte. vol. 3, pp. 178-79. Paul-Philip, Comte de Ségur, History of the Expedition to Russia Under-taken by the Emperor Napoleon in the Year 1812. (London: Treuttel and Wurtz, 1827), vol. 1, p. 97. Ibid., vol. 1, pp. 97-98. Joseph, Comte Vigier, Davout: maréchal d'empire, duc d'Auerstaedt, prince d'Eckmühl, 2 vols. (Paris: 1898); Charles Joly, Le Maréchal Davout: prince d'Eckmühl, (Auxerre: 1864); L.-J.-Gabriel, de Chénier, Histoire de la vie politique, militaire et administrative du maréchal Davout, (Paris: 1866). Ibid., No. 18984, July 20, 1812, vol. 24, pp. 93-94. Ségur later would write that Napoleon accused Davout "of suffering the escape of the left wing of the Russians by remaining four days in Minsk." See Ségur, History of the Expedition to Russia, vol. 1, p. 151. See Ségur, History of the Expedition to Russia, vol. 1, p. 281. Caulaincourt, Mémoires, vol. 2, p. 158. 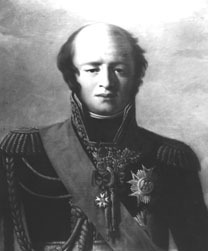 Following Davout's defense of Marshal Ney at the latter's trial for treason (in the Fall of 1815), he was sent into exile. Not until 1818, through the intercession of his friends at court--in particular Marshal Nicholas-Charles Oudinot, was Davout received at court and completely rehabilitated. He only sought reconciliation with the Bourbon's for the sake of his family. Napoleon had not forgotten the Malet Affair of 1812, when that general declared the emperor dead in Russia and tried to take over the government in Paris.